I send them a mail about a month ago, with the request to get access. I didn’t actually expect them to give tourists access. But a few days later I got an email back from them, with an official invitation, they had made a reservation for me on Friday the 4th of November at 10.15. I had to meet up at their reception with my passport and the invitation. And so I took the tube. At the gate I pushed a button, and the loudspeaker asked me for my name. I answered and cringled myself through the turning fence. I followed the arrows to “reception”. I went up the stairs and presented myself with the man behind the glass window. I gave him my passport and invitation, and wrote my name on the visitor list. I got a visitor pass which I clipped on to my jeans. A man walked with me showing me the way. We walked through a long corridor, and I had to use my visitor pass to open the first door. We walked on and ended in front of door number 2, which I again opened with my magical pass. The man was leaving me now, telling me I should walk to the end of the corridor where someone would be waiting for me. I walked through the long corridor and ended in a space where a man behind a pc welcomed me. I gave him my magical pass, and got a form I had to fill out. I did just that, and I now got a daypass. Pfew, so far so good. The man behind the pc walked to the cupboard and came back with the materials I had reserved. I was guided to a small seperate room, I got a set of headphones, and was seated behind a tv and a video machine. It did feel like entering Ford Knox, but after all the checks, double checks and forms I was now ready for the thing I came for. 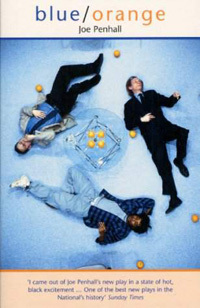 I enjoyed 1 hour and 50 minutes of Blue / Orange, I laughed quite a lot, and it was all for free. This was also English bureaucracy in a nutshell, but it was completely worth it. Bill was fantastic.